Is it really the first Monday in March? Where has the time gone!? I took a quick glance at my February posts and apparently a lot my time has been focused on reading, which is a great thing. I managed to get through 12 books which is more than I read in all of 2014. My March TBR list is already looking to surpass that number so we'll see how it goes. This is my third edition of Book Bag Monday and I realized the other day that I didn't actually have a dedicated book bag. 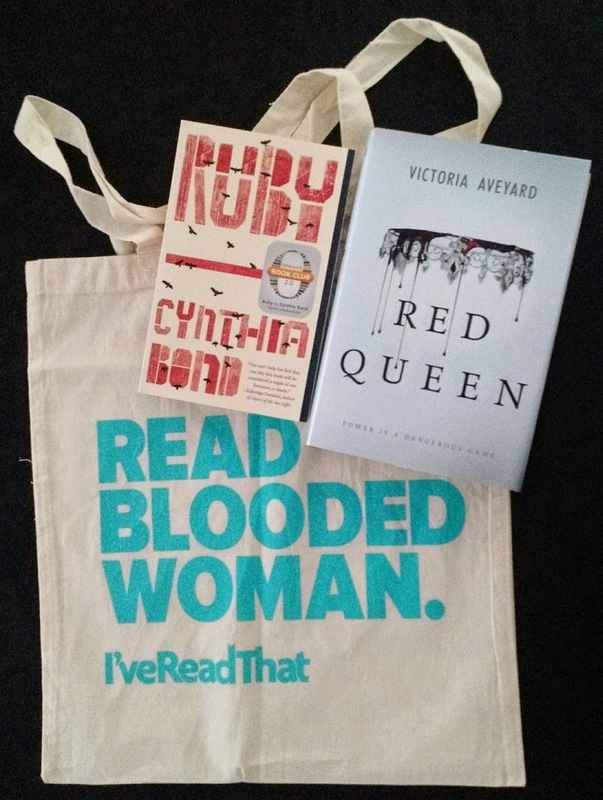 Lucky for me the team at IveReadThat.com came to the rescue and sent me this lovely "Read Blooded Woman." tote. I've Read That is a new social platform where users can connect and share their thoughts on books they've read 400 characters at a time. You also get a peek at what your friends and followers are reading and reviewing. The site is still in Alpha meaning the team is still working out some kinks, but you can still sign up and the IRT team will send you an invitation when they're ready. The team is also great fun to follow on Twitter. Their @IveReadThat account posts all sorts of bookish news and events. Check them out! The latest additions to my ever growing book collection are two great finds that I picked up on a recent visit to Costco. Ruby by Cynthia Bond - This book is the latest addition the Oprah Book Club 2.0. This book is an epic, unforgettable story of a man determined to protect the woman he loves from the town desperate to destroy her—this beautiful and devastating debut heralds the arrival of a major new voice in fiction. Red Queen by Victoria Aveyard - The first book in a YA Trilogy filled with magic, a fight for power and a world divided by blood. What's new in your bag this week?